Expedition' is a modern tapestry based on the work of Jane Bellows. The use of areas of texture and color, nature inspired motifs such as leaves and inscriptions is illustrated here in this work. Bellows was brought up in Seattle on the west coast, and she has an interest in abstract painting as well as a background in a Fine Arts in Photography degree. 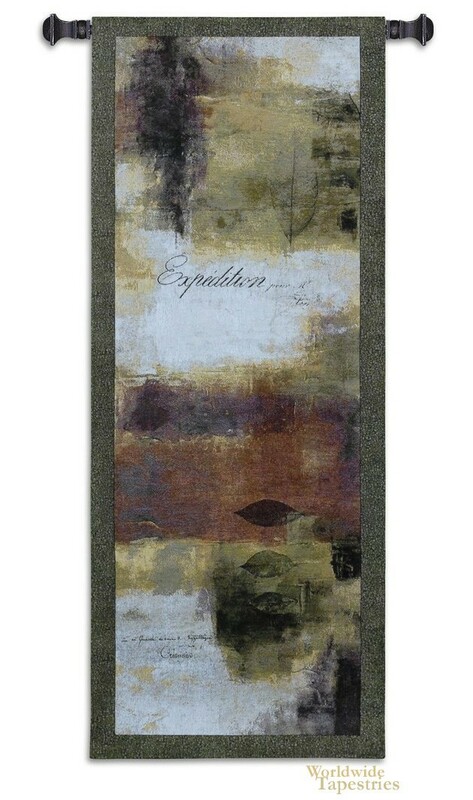 This tapestry would suit a room or home requiring an abstract art influence. This tapestry is backed with a lining and has a tunnel for easy hanging. Note: tapestry rod and tassels, where pictured, are purchased separately. Dimensions: W 21" x H 53"